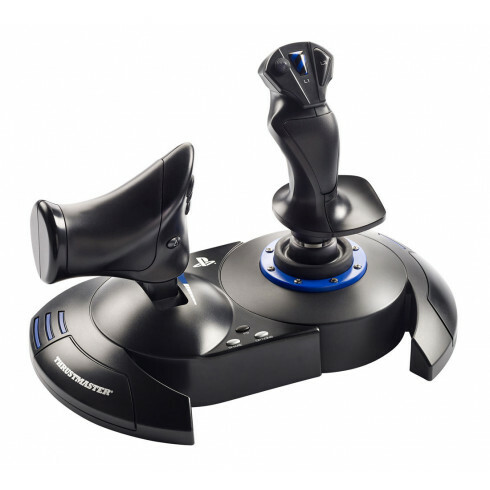 The newest Thrustmaster joystick for PlayStation 4 and PC: Thrustmaster T.Flight HOTAS 4! This joystick provides a high level of realism: its stick features a large hand rest and easily accessible rapid-fire trigger. The life-size, detachable throttle provides super-responsive power. The dual rudder system works by rotating the handle (with integrated locking system) or by progressive tilting lever. T.Flight Hotas 4 is also programmable, mappable and features an internal memory to save the latest programming, even when disconnected. It has built-in official buttons for PlayStation 4 system (PS/SHARE/OPTIONS) and access social functions, switch between the game and the system, navigate through the system's menus, etc. In compatible games the T.Flight HOTAS 4 is recognized as a real joystick for optimum flight precision. Comprehensive flight gear: 5 axes + 12 action buttons + 1 rapid fire trigger + 1 multidirectional hat switch (navigation / panoramic view). or attached to the joystick (for greater stability and to take up less space).